← The language has changed – will the strategy match it? I blogged recently (as did several others) about the Mayor of London’s new Vision for Cycling document, which, while short on detail, appears to represent a new approach towards cycling in London; responding to the concerns and needs of the vast majority of Londoners who do not consider riding a bicycle to be an attractive or appealing prospect. The Vision recognises that cycling in motor traffic is not something that most people want to do, and proposes policies that should make cycling a comfortable and pleasant experience in London – separation from traffic on major routes, and the removal of through traffic on quieter residential streets, to form ‘Quietways’. One of the groups who stand to benefit most from this new strategy, if successfully implemented, are children and young people; a child on a bicycle is, in my experience, an extraordinarily rare sight in London, certainly away from the pavement. Even in London’s best-performing borough, Hackney, just 3% of children cycle to school, while 33% want to. I expect a similar, if not worse, picture across the rest of London; a massive amount of suppressed demand for cycling amongst the young. As it happens, at precisely the same time the Mayor’s Vision is being launched, Transport for London are also consulting on a document entitled School and Young Person Delivery Plan: Setting our future direction which has the intention of, amongst other things, ensuring that Transport for London meet the needs of young people. Young people are significant users of the capital’s transport network; whether it is for their journey to school or college, meeting friends or family or going to work…. Using the transport network is incredibly important to young people and to enable them to get the most of London we have an important role to ensure travelling in London is a happy, healthy and safe experience. So how does this consultation document fare on the matter of cycling for young people in London? There are a variety of sections that tangentially relate to cycling, and unfortunately all are very disappointing. The section on ‘Community and Personal Safety’ is entirely about safety from crime. This is obviously important, but not the only way in which children can be put into danger. ‘Educate young people’ to behave properly on the roads, give them the ‘life-skills’ to identify hazards, and ‘encourage’ young people to understand the consequences of their actions. And that’s it. Pretty miserable stuff, not just because of a failure to address creating safer streets, but also because all this ‘education’ and ‘encouragement’ is only directed at children themselves. There is nothing in this strategy that talks about getting drivers to behave better, or ‘educating’ them to drive more carefully around children. Nothing. It’s victim-blaming of the worst kind. 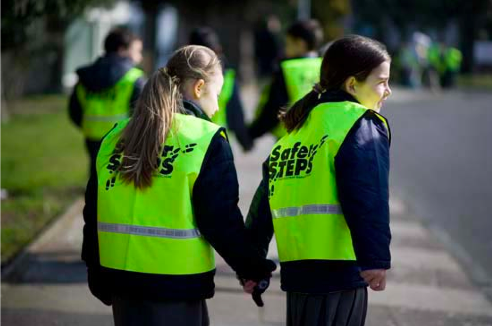 But a disproportionate number of pedestrians will be children in the first place; they can’t drive, so will be walking to school, or walking to catch the bus, unlike adults, many of whom will be driving instead. TfL don’t seem to have taken this into account, and have simply assumed that children forming a high percentage of pedestrian casualties is because they are ‘behaving badly’, rather than because they a relatively large percentage of pedestrians will be children. It’s quite blinkered. 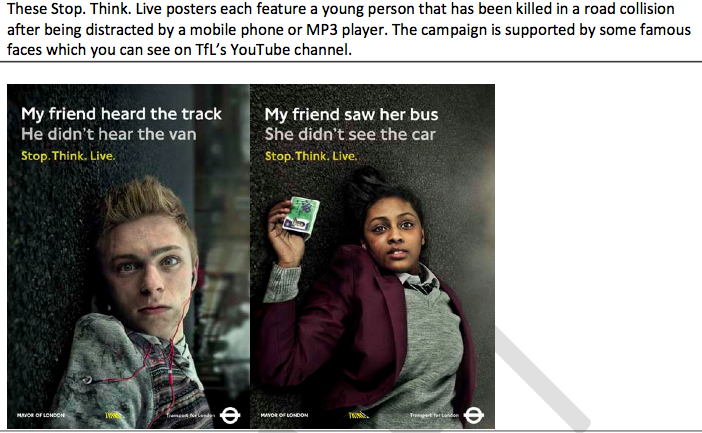 The response to some boroughs having high numbers of teenage casualties is to ‘raise awareness of road safety and encourage responsible behaviour’ amongst teenagers in these places – no assessment of how and why these teenagers are being killed, whether driving standards might be lax in these boroughs, whether the streets are dangerous to cross or walk along, or whether there might simply be more teenagers out on the streets here. TfL might, of course, be doing these things elsewhere, but why is this kind of rational approach completely absent from this document? Why shouldn’t higher driving standards, safer street design, or lower vehicle speeds be put forward as policies to reduce child casualties? Amazingly, it’s not in this strategy document. There is nothing about making junctions safer, or providing safe cycling routes separated from motor traffic. Nothing. Of the ten ‘initiatives’ TfL are proposing to increase child safety, every single one involves training or educating children. There’s no mention of reducing environmental danger. The same ‘educating’ and ‘training’ strategy is employed by TfL in ‘encouraging’ young people to walk and cycle, in the section of the document specifically on ‘Active and Independent Travel’. 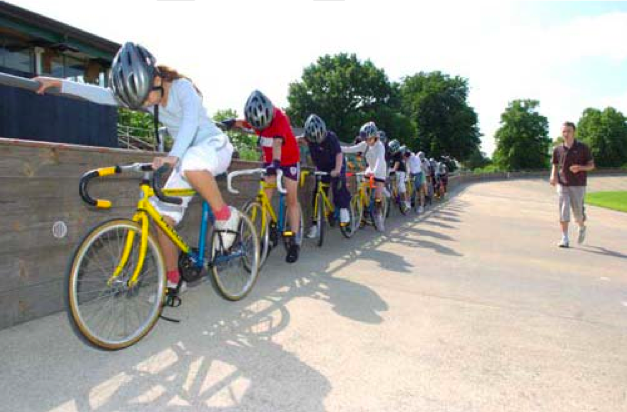 There’s a nice picture of some children engaged in cycle sport, strapped onto brakeless track bikes on a velodrome – obviously completely irrelevant for any child attempting to cycle to school or around their neighbourhood, not even useful training. The focus of the strategy in this section is almost entirely on ‘workshops’, ‘education’ and ‘training’, and encouraging schools to get more of their pupils to walk and cycle through accreditation schemes. Again, there’s nothing on making the roads and streets themselves attractive or inviting for walking and cycling. I’m assuming this document was drafted in isolation of the Mayor’s new Vision for Cycling – it certainly reads like it. It might be wise if TfL ditched this consultation and came back with a new one that incorporated the eminently sensible strategy advice outlined in that new document, because it’s simply not up to scratch, certainly as regards cycling. We need safer, more pleasant streets for our children to walk and cycle one, and for a document about encouraging walking and cycling in these age groups to fail to even mention improving the streets themselves is quite scandalous. The consultation runs until 27th March. Do have your say. This entry was posted in Boris Johnson, Cycling policy, Go Dutch, Infrastructure, London, Safety, Subjective safety, Transport for London. Bookmark the permalink. Did you notice the ‘Cycle to School Partnerships” promised in the Vision for Cycling document? Will be interesting to see what TFL are intending there – and whether there is any significant funding for infrastructure improvements. That does all sounds very poor indeed. However while the language of the “delivery plan” is not so carefully crafted to avoid criticism as is the the Mayor’s “New Vision”, the intent is perhaps not so far removed. Remember that the stated target of the “New Vision” is only 5% of journeys by bike in ten years time. i.e. it’s not intended to result in huge growth in cycling and they will count themselves as having succeeded if this very low rate of growth is met. If they achieve their target, the low level of cycling overall means that you’re still not going to have the 33% of children who said they wanted to cycle to school actually doing so. Mind you, by then they won’t be the same children as today’s lot will have grown up. What’s actually being committed to by the “New Vision” is that the next generation of children should also miss out on cycling to school. This is why I see the plan as not adequate. In ten years time, not much will have changed. The language is lovely, yes. It presses all the right buttons amongst the intended readership, which is to say amongst cyclists. However that is perhaps a function of its author. It is surely not for nothing that Boris chose to employ a journalist as the cycling commissioner rather than an engineer. If you want good headlines, a journalist is surely the man for the job. If you want someone who is used to dealing with uncertainties and who will do the figures then you may be better off with an engineer. Well, I responded to the consultation, they aren’t going to like it! I definitely think education has a role, but putting it forward as a substitute for a safe environment is ridiculous. The construction industry has probably done more on risk & accident prevention than any other in recent years (because it was so bad) and the advice from there is clear – remove the danger & only consider education/protective equipment as the last resort. Indeed. Road safety is not “health and safety gone mad”, because traditional approaches to road safety, and this is one of them, do not adhere to the same “hierarchy of management risk control” that occupational H&S adheres to. Rather than prioritise elimination or substitution of risk factors (in this case motor vehicles), or, where this is not feasible engineering controls to provide seperation and protection; this delivery plan prioritises the measures at the bottom of the hierarchy – education and PPE (personal protective equipment, not the degree). Why on earth do they think that they need to educate children (and people in general) about the dangers of cycling on London’s roads? Can they not see that everyone knows that cycling in current conditions is dangerous, and that this is by far the biggest reason why children do not cycle, even though they would really like to? Educating and encouraging people to cycle, without making cycling visibly safer to the general public, is doomed to fail. If anything telling people that its dangerous, and that you need training and high-viz and helmets, will tend to reduce the numbers of people choosing the bicycle as their mode of transport for journeys. Hi-viz and lights are all very well if the driver coming up behind you is looking at his phone. Schools aren’t going to advocate cycling or provide enough parking until the roads are safe enough to cycle to school. It seems impossible to get anyone up top to see this as an urgent national problem and we are failing the next generation by forcing them into their parent’s cars. 30% of children who would cycle, can’t, not wont. Can’t. This is a violation of their rights and a tragedy and a time bomb this country will face in generations to come. Speaking as an accredited Cycle Trainer with a child in a track-based cycling club, I’d actually say time in the velodrome will be at least as useful as a lot of what goes in to Bikeability. On the track you will be dealing with “traffic” to a far greater degree than you do on the quiet backroads where training usually goes on, and you’ll be doing it at more realistic speeds too: you get very good at observing before you move because the consequences are a lot more vivid that the Bikeability instructor reminding you about your life-saver… It’s a lot more real, and without brakes you have to learn a lot about the real practicalities of predictability which is what really underpins “vehicular cycling”. Anybody can use brakes, not everyone can avoid the situations where they’re necessary. My son is a lot better on the road since he started going to the track. This doesn’t in any way contradict your primary point (with which I agree), but is more a point that while a lot better than nothing, our current training programmes are very far from perfect. That is really because we’re trying to train kids up for an environment which is awkward enough that, frankly, they shouldn’t have to deal with it at all. You have to start off in places that boil down to safe, and because you make sure it’s as safe as reasonably possible it’s not much to do with the reality of going further than your pal’s place round a couple of (quiet) corners. Bikeability isn’t going to take us beyond our existing core of enthusiasts, and while it is a good start fro those that will go on to be enthusiasts it won’t do much more. I think trying to train children up for an environment which they shouldn’t have to deal with it at all and making the roads and streets themselves attractive for walking and cycling. You know, us teenagers aren’t stupid. We don’t try to have a crash. Unless of course someone becomes suicidal, that’s always sad. You don’t blame the driver in the last case for running over the guy. We know very well that having a charging elephant is dangerous in the same way that we know that a speeding truck is dangerous. It’s our instinct to avoid pain and injury. It can be inhibited of course, this is why teenage drinking can go sour very easily even if you are the kind that does it in moderation, although ideally you wouldn’t drink until 18, but even drunk people usually will avoid injury or death as best they can. This is also the thing that my own city is doing with its Vision 0 policies. I mean it’s a good goal, one that we should strive for, but they adopted pretty much only the education and enforcement components. Enforcement? Eh, that’s good. I have a feeling though that it’s going to be just a big ticketing blitz and more automatic cameras. Those don’t stop you from committing the offense itself though. And the police can only stop you once you have done the dangerous thing, not before. Education is not all that much intended for children, it’s mainly the city plastering messages on the sides of buses and on signs next to the road at car driver eye level. I imagine that the city is going to reprogram the variable message boards too to say “Vision 0” or something along the lines of that too. They do add things like rebuilding the right turn slip lanes around the corner to avoid traffic lights and they do add turn arrows are certain junctions, maybe adding amber flashers to zebra crossings, but nothing compared to Sustainable Safety. The latter comprises just about everything. Massive focus on the road itself, ensuring that different modes are separated when their differences become too dangerous to mix, that errors are not lethal nor able to lead to serious injury and that people understand how to be a road user on any given thoroughfare. Vehicle design so as to ensure that the kinds of crashes a car can have gives the least amount of problems to the occupants, to the other victims in a car crash and ideally protect the vehicle itself too if you can. Education is mainly formal in schools for children and via driver’s ed courses, the graduated driver licensing being a good way to improve this for young people. Enforcement takes place through penalties that correctly correlate with the offender and their misbehavior and what they can give up without becoming impoverished, new ways of enforcing the laws, widespread enforcement of automatic cameras in areas where the rules can’t be enforced because the road suggests the correct behavior, like a 90 km/h speed limit on a motorway. It works much better for everyone, with no victim blaming.